The most popular cookie in the United States, based on sales, is the Oreo. For most of its history, owner Nabisco (originally National Biscuit Company) only made the basic version of this cookie. But in recent years, increasingly since 2010, it has expanded to a great many varieties, both domestically and globally. In addition to their traditional design of two chocolate wafers separated by a Vanilla creme filling Oreo cookies have been produced in many different varieties since they were first introduced, and this list is only a guide to some of the more notable and recent types; not all are available in every country. Double Stuf Oreo (introduced in 1974) have about twice the normal amount of white creme filling. Available in peanut butter, original, cool mint, chocolate creme, and birthday cake. In the UK they are called Double Stuff Oreo (note the double 'f') and are currently only available in original. Big Stuf Oreo (introduced in 1987) were several times the size of a normal Oreo. Sold individually, each Big Stuf contained 250 calories (1,000 kJ) and 13 grams of fat. They were discontinued in 1991. Mini Oreo, originally released in 1991, are bite-sized versions of ordinary Oreo cookies. After being discontinued in the late 1990s they were re-released in 2000 along with the redesigned 2001 Dodge Caravan as part of a promotional tie-in with DaimlerChrysler Their 1990s packaging consisted of a "miniaturized" version of the full-size cardboard tray and box used in packaging at the time. Their current packaging consists of a plastic, foil-lined bag.. Mini Oreos are also available, in original, mini, golden, and Reese's varieties, in Nabisco To-Go Cups, lidded plastic cups which fit into car cup-holders, along with other Nabisco snacks in miniature form, such as Nutter Butters. In 2015, a new flavor of the mini Oreo, mint, debuted. 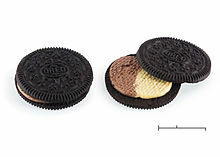 Triple Double Oreo, for sale in the US in summer 2011, combine three wafers with two layers of creme, one vanilla, and one chocolate. Triple Double Neapolitan Oreo, similar to the original triple double Oreo cookies, but are three vanilla Oreo cookies, with chocolate filling between the first and second cookies, and strawberry filling between the second and third. Triple Double Chocolate Mint Oreo was a Limited Edition oreo with chocolate and mint Creme. 100 Calorie Pack Oreo (Oreo Thinsations in Canada) are miniature, thin, hexagonal versions of Oreo with no creme-filling, and come individually portioned into 100 calories (420 kJ) pouches. Mega Stuf Oreo, introduced in February 2013, are similar to Double Stuf Oreo cookies, but with even more white creme filling. They come in both chocolate and golden varieties. Golden Mega Stuf Oreo are Golden Oreo versions of Mega Stuf Oreos. Heads Or Tails Mega Stuf Oreo are Mega Stuf versions of Heads Or Tails Oreos. Oreo Thins, released in 2015, are thin versions of these cookies. They come in the following varieties: chocolate, golden, mint, lemon, coconut, salted caramel, pistachio, and pina colada. They have 40 calories per cookie. At 10.1 ounces, the package is lighter than the normal 14.3 ounce package, at same cost. "The Most Stuf" A limited edition Oreo introduced in 2019 with approximately 4 times the filling of a standard Oreo. Android Oreo, special cross promotional Oreo cookie with Google Android logo on one side and "green" flavoring. Coconut Delight Oreo, introduced in Indonesia. As its name implies, an Oreo cookie with coconut crème filling. Strawberry Milkshake Oreo, introduced in Canada, and sold for a limited time in the United States, is an Oreo cookie with strawberry flavoring. Strawberry Oreo, introduced in Indonesia, Malaysia, Philippines, and Singapore. Green Tea Oreo, introduced in China and Japan. Lemon Ice Oreo, introduced in Japan. Organic Oreo, introduced in 2006, are plain Oreo cookies made with organic flour and organic sugar. Blueberry Ice Creme Oreo, introduced in Singapore, Indonesia and Malaysia in 2010. Also sold in Thailand and China. Orange Ice Cream Oreo, introduced in Indonesia, Malaysia, Singapore and Thailand in 2011. Double Stuf Golden Oreo, introduced in late August 2009. As the name indicates they are Double Stuf Oreo cookies with Golden Oreo biscuits instead of normal chocolate Oreo biscuits. Golden Oreo series have vanilla biscuits with other fillings such as vanilla and chocolate as Uh-Oh Oreo until its re-branding in 2007. Introduced in Indonesia in 2011 with cookies and creme. Oreo Heads or Tails have vanilla creme filling with a chocolate Oreo wafer on one side and a Golden Oreo wafer on the other. Creamsicle Oreo have vanilla and orange creme filling with vanilla Oreo wafers. Ice Cream Oreo Rainbow Shure Bert have rainbow sherbet filling with vanilla Oreo wafers. Double Delight Oreo, introduced in 1987, have chocolate cookies with two fillings, notably peanut butter and chocolate, mint and creme, and coffee and creme flavors. Also there are ongoing fruit series: orange and mango, raspberry and blueberry, grape and peach in China. Cool Mint Creme Oreo are a Double Stuf Oreo with a slight minty creme filling. Peanut Butter Oreo are a Double Stuf Oreo with a peanut buttery creme filling. Pure Milk Chocolate Covered Mint Oreo are similar to Milk Chocolate Oreo but have a mint-flavored filling. Banana Split Creme Oreo with a light yellow banana flavor filling, were available for a limited time in 2008. Brownie Batter Oreo introduced in August 2015, two chocolate cookies with brownie batter flavored creme filling. Sugar Free Oreo, introduced in 2006, cost over twice as much as regular Oreo cookies, and had only trace amounts of sugar, 10 fewer calories per serving, 0.5 grams more fat and 450% more fiber. Reduced Fat Oreo, introduced in 2006, cost the same as regular Oreo cookies, had as much sugar, 10 fewer calories per serving, about 35% less fat and the same amount of fiber. During springtime, around Halloween, and Christmas, special edition "Double Stuf Oreo" cookies are produced with colored frosting reflecting the current holiday (blue or yellow, orange, and red or green respectively). Also, one side of each seasonal cookie is stamped with an appropriate design: the spring cookies feature flowers, butterflies, etc., and the Hallowe'en Oreos bear a jack o'lantern, ghost, cat, flock of bats, and/or broom-riding witch. Chocolate and Dulce de leche Oreo, sold in Chile and Argentina, has chocolate or Dulce de Leche instead of the usual creme. Birthday Cake Oreo cookies were a limited-edition release in February–July 2012 to celebrate Oreo's 100th birthday, made up of two chocolate Oreo cookies with a birthday-cake flavored filling and sprinkles inside. This edition replaced the traditional design on one of the two cookies with a birthday candle and the words "OREO 100". The flavor has been reintroduced, with "double stuff" amount of creme filling, in both chocolate and golden Oreo varieties, except that the cookies no longer display the "OREO 100" print. Birthday Cake Oreo - Fudge Dipped Vanilla were a limited-edition release in February–July 2012 to celebrate Oreo's 100th birthday, made up of one vanilla Oreo cookie with a birthday-cake flavored filling and sprinkles inside. The cookie and frosting are then dipped in fudge so that the entire cookie is covered. Candy Cane Oreo was first released for the holidays in 2012, later returning as Peppermint Oreo in the years following. Candy Corn Oreo cookies are a Halloween-related flavor, made up of two golden Oreo cookies with a flavored filling that was half yellow and half orange. They were a limited edition release in 2012 that returned in 2013. They made another return in 2016 at Target stores only. Gingerbread Oreo cookies were a limited edition release made up of two golden Oreo cookies with a mild gingerbread flavored filling. The American Creme were a limited edition release in 2012 made up of two golden Oreo cookies with red-and-blue colored creme. Berry Oreo cookies were made up chocolate cookies with berry flavored filling. Lemon Twist Oreo cookies were a limited edition release in 2012 that returned in 2013, made up of two golden Oreo cookies with a lemon flavored filling. Neapolitan Oreo cookies were a limited edition release in 2012, made up of three golden Oreo cookies with a double sandwich of chocolate and strawberry creme fillings. Ice Cream Rainbow Sure, Bert! Oreo cookies were a limited edition release in 2013, made up of two golden Oreo cookies with a double stuf-thickness layer of tri-color raspberry and lime sherbet flavor creme filling. Watermelon Oreo cookies were a limited edition release for the summer of 2013, consisting of two golden Oreo cookies with watermelon-flavoured filling. Strawberries n' Creme cookies were a limited edition release in 2013, made up of two golden Oreo cookies with a creme consisting of two halves, one strawberry-flavored and one similar to traditional oreo creme. Banana Split Oreo cookies were a limited edition release in fall 2013, made up of one golden and one chocolate Oreo, with a double stuf-thickness layer of strawberry and banana flavor creme filling. Limeade Oreo released in 2014, two vanilla cookies with a lime flavored creme inside. SpongeBob Oreo limited edition release in 2014, featuring chocolate cookies with yellow creme and one side of each cookie donning a SpongeBob SquarePants character design. Fruit Punch Oreo limited edition release in 2014, featuring vanilla cookies with fruit punch flavored creme. Cookie Dough Oreo limited edition release in March 2014, featuring chocolate cookies with cookie dough flavored creme. Caramel Apple Oreo limited edition release in August 2014 exclusively at Target stores, featuring vanilla cookies with caramel apple flavored creme. Pumpkin Spice Oreo limited edition release in September 2014. Golden Oreo cookies with pumpkin spice flavored filling. Red Velvet Oreo limited edition release in February 2015. Red Oreo cookies with creme cheese flavored filling. Reese's Peanut Butter Cup Oreo, introduced in May 2014, similar to peanut butter Oreos, but with half peanut butter and chocolate filling. Cotton Candy Oreo limited edition release in April 2015 exclusively at Target stores, made of two golden Oreo cookies with cotton candy flavored pink and blue creme filling. S'Mores Oreo limited edition release in May 2015, made of two graham flavored Oreo cookies filled with both chocolate and marshmallow flavored creme. Root Beer Float limited edition release in July 2014, made of two gold Oreo Cookies filled with root beer flavored creme. Key Lime Pie limited edition release in July 2015, made of two graham flavored Oreo cookies filled with key lime creme. Marshmallow Crispy limited edition release in March 2014, made of two gold Oreo Cookies filled with marshmallow flavored creme and rice crispies. Cookies & Creme limited edition release in July 2015, featuring chocolate cookies with cookies & creme ice cream flavored filling. Toasted Coconut Oreo limited edition release in September 2015, featuring vanilla cookies with toasted coconut flavored creme and flakes of toasted coconut. Oreo Thins, released in 2015, are thin versions of these cookies. They come in chocolate, golden, mint, chocolate creme, lemon and tiramisu kinds. Fruity Crisps Oreo limited edition released June 2016, featuring vanilla cookies with a creme interspersed with fruit-flavored "colorful rice crisps" similar to Fruity Pebbles (but without the Post brand name. Blueberry Pie Oreo limited edition released June 2016, featuring vanilla cookies with "Blueberry Pie" flavored creme. Originally distributed exclusively through Target. Swedish Fish Oreo released in August 2016 combined chocolate cookies with creme flavored to resemble the red-colored Swedish Fish candy. Originally released exclusively through Kroger stores. Dunkin' Donuts Mocha Oreo limited edition release in July 2017, using chocolate Oreo cookies and mocha flavored creme filling. Cookie Butter Oreo was released in September 2017, using graham-flavored Oreo cookies with cookie butter-flavored creme. Apple Pie Oreo was released in September 2017, using graham-flavored Oreo cookies with apple pie-flavored creme. Mystery Oreo, released in October 2017, contains a chocolate cookie with a mystery flavor filling. It had a contest on what the flavor was, until December 2017. It was confirmed to be Fruity Pebbles as the mystery flavor. "Dark and White Chocolate Oreo", released in October 2017, have chocolate cookies with two fillings: dark and white chocolate with vanilla flavor. "Chocolate Hazelnut Oreo", Spicy Hot Cinnamon Oreo and "Hot Cocoa Oreo" are three different flavors that were released in January 2018. Peeps Oreo limited edition release in February 2018, made of two chocolate cookies filled with "Marshmallow Peeps flavored creme"
"Cherry Cola Oreo", "Kettle Corn Oreo" and "Pina Colada Oreo" thins were released in April 2018 as part of the "My Oreo Creation" campaign. "Good Humor Strawberry Shortcake", golden cookie, strawberry shortcake filling, limited edition July 2018. "Hot Chicken Wing Oreo" & "Wasabi Oreo" Were Oreos first released on August 29, 2018 in China with Artificially-Flavored Wasabi And Hot Wing Creme Filling. "Choc'o Brownie Oreo"' was a Brownie Flavored Oreo released on September 15, 2018. Dark Chocolate Oreo is a Dark Chocolate Oreo Flavor with Cocoa Creme and It was released January 2nd, 2019. Love Oreo is a "Sweet and Tangy" Pink Creme Oreo Flavor for Valentines Day Released on January 2nd, 2019. Carrot Cake Oreo is a Carrot Cake-Flavored Oreo Cookie Released on January 4th, 2019. Fudge Covered Oreo, White Fudge Oreo, Mint Fudge Oreo, and Milk Chocolate Oreo are covered in either a layer of fudge, white fudge, mint fudge, or milk chocolate respectively. The Mint Fudge variety is nearly identical to Mystic Mints, produced by Nabisco from the 1970s through the 1990s. In the US, the white fudge variety is marketed as seasonal and is only broadly available the Thanksgiving-Christmas holiday period. Oreo Fudge Cremes are a single cookie (not a sandwich), with creme, covered in fudge, in various flavors. Oreo Fudgees are rectangular "dipping" shaped Oreo cookies with a chocolate fudge filling (different from the Chocolate Creme Oreo). Oreo Fudge Sundae Creme, a limited edition introduced in 2009, are chocolate ring cookies with traditional white creme filling on half a ring cookie, and fudge creme on the other half. Oreo Fudge Rings are chocolate ring cookies with the traditional white creme filling drizzled over them. Oreo Cakesters, introduced in 2007, are soft chocolate snack cakes with vanilla or chocolate creme in the middle. Oreo's version of a whoopie pie. Oreo WaferStix are long wafer sticks with a creme filling and covered by chocolate. Oreo Handi-Snacks are plastic holders with rectangular Oreo cookies and a little box of icing. Oreo Sippers were Oreo flavored sticks that could be eaten or used as a straw; it was discontinued in 2012. 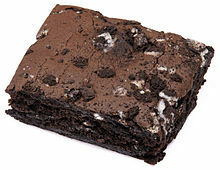 Creme Filled Oreo Brownie is a brownie with Oreo Creme Filling inside. First Released in 2013. Jell-O Oreo Pudding – Jell-O brand chocolate pudding at the bottom and on top, with vanilla in the middle. Jell-O Oreo Instant Pudding – also named Cookies n' Creme. The box contains instant vanilla pudding with real cookie pieces. There was a Post cereal called Oreo O's; it was discontinued in 2007 but reintroduced in 2017. Golden Oreo O's were introduced in 2018 and first sold at Walmart. Oreo Ice Cream is also called Cookies and Creme. Oreo Chocolate Candy Bar- A chocolate candy bar with a rectangular Oreo cookie and Oreo creme filling covered in milk chocolate. Oreo Pie Crust, a pie crust made of crushed Oreo cookies, sold around the U.S.
Banana Split Oreo, introduced in Canada, an Oreo cookie with banana flavoring. Oreo Milkshake is a Kraft Foods recipe consisting of Oreo cookies, milk, vanilla ice-cream and chocolate syrup. Cadbury Dairy Milk 'with Oreo' - Cadbury milk chocolate with an Oreo filling. Also comes in Peanut Butter flavor. Milka 'Milka & Oreo' - Milka milk chocolate with an Oreo filling. Also comes in Mint flavor. Tim Hortons Canadian-based coffee chain released a 'Oreo' donut - chocolate donut with Vanilla Creme Filling, White Fondant frosting and Oreo cookie crumb topping. Oreo mini bars, Japanese, in various flavors, eg orange chocolate, bitter chocolate, green tea chocolate, Amaou strawberry, macadamia nut. Oreo Music Box is a strange "Record Player" that plays music when you put an Oreo in it, and the music changes when you take a bite out of it. Released in November 19, 2018. ^ a b "Fact Sheet: Oreo's 100th Birthday" (PDF). Nabisco. Archived from the original (PDF) on October 28, 2013. Retrieved July 20, 2012. ^ Brataas, Anne (July 7, 1989). "The Era Of Gargantuan Gastronomy Belies Our Concern With Calories". Chicago Tribune via Knight-Ridder. Retrieved July 20, 2012. ^ Foltz, Kim (1991-10-24). "RJR Nabisco Reports Neet Of $123 Million in 3d Quarter". Nytimes.com. Retrieved 2011-03-02. ^ "New Mini Oreos Debut in New Mini Van". PR Newswire. 2000-08-10. ^ Goldwert, Lindsay (May 13, 2011). "Triple Double Oreos to hit shelves; Oreo cookie has double chocolate and vanilla filling". Daily News. Retrieved May 15, 2011. ^ Bell, Karissa. "Of course there are actual Android Oreos". Mashable. Retrieved 2018-04-22. ^ "Limited Edition Oreo Strawberry Milkshake Creme". Theimpulsivebuy.com. 2008-04-25. Retrieved 2013-11-16. ^ a b Erdos, Joseph (March 2, 2012). "International Oreos: Wacky Flavors From Foreign Countries". The Huffington Post. AOL. Retrieved April 17, 2012. ^ "Recipe Search Results - Snackworks". com. Retrieved 13 October 2014. ^ a b "Sugar-free Oreos are still a no-no". Consumer Reports. ^ Modell, Josh (March 5, 2012). "Birthday Cake Oreos". A.V. Club. Retrieved June 28, 2017. ^ "Product Search Results - Snackworks". com. Retrieved 13 October 2014. ^ a b Clinton, Leah Melby (17 June 2015). "A Comprehensive List of Every Special Oreo Flavor, Ever". glamour.com. Retrieved 21 February 2017. ^ "OREO Brand Partners with Paramount Pictures for the release of Michael Bay's "Transformers: Age of Extinction"". mondelezinternational.com. Mondelez Philippines, Inc. 13 June 2013. Retrieved 21 February 2017. ^ Oreo's Latest Limited-Edition Flavor: Watermelon, Time Magazine Online. Published and retrieved 18 June 2013. ^ , The Impulsive Buy. August 13, 2013. ^ "Foodbeast Limeade Oreos Review". Foodbeast.com. 2014-06-24. Retrieved 2014-08-19. ^ Armando Villaseñor. "Reconocimiento a Oreo - Multipress". Multipress. ^ Moss, Michael (March 11, 2014). "The Cookie Dough Oreo". nytimes.com. ^ "Caramel Apple Oreos Arrive In Target Stores Today". Consumerist. Retrieved 13 October 2014. ^ Grossman, Samantha (May 17, 2015). "S'mores Oreos are Coming and We Can Confirm They're Delicious". Time. ^ a b "Taste Test Tuesday: International Oreos And Kit Kats". Westchester Magazine. Westchester Magazine. Retrieved 4 July 2016. ^ Houck, Brenna (19 January 2016). "Oreo Debuts New Cinnabon Bun-Flavored Cookies". yahoo.com. Retrieved 21 February 2017. ^ Lee, Patty (2 February 2016). "Oreo debuts new Filled Cupcake flavor—but is it any good?". today.com. Retrieved 21 February 2017. The Filled Cupcake Oreo is reminiscent of another beloved treat, Hostess' iconic cream-filled chocolate cupcake. Oreo's take features two of its regular cocoa wafers sandwiching chocolate frosting with a dollop of vanilla cream in the center. ^ Cave, James (February 2, 2016). "Oreo Debuts A New Flavor That Tastes Like A Filled Cupcake". Retrieved August 5, 2016. ^ a b Ayerouth, Elie (26 May 2016). "NEW OREO FLAVORS: Blueberry Pie & Fruity Crisps". foodbeast.com. Retrieved 21 February 2017. ^ Saltz, Joanna (27 December 2016). "Delish Exclusive: Oreo Releases Chocolate-Covered Strawberry Flavor And Everything Is Awesome". delish.com. Retrieved 24 April 2017. ^ McCluskey, Megan (10 August 2016). "Swedish Fish Oreos Are Now a Real Thing Because Why Not?". time.com. Time. Retrieved 21 February 2017. ^ Ledbetter, Carly (2 February 2017). "Peeps-Flavored Oreos Are Here And We Don't Know Who Will Eat Them". huffingtonpost.com. Retrieved 21 February 2017. ^ Council, Bryan (8 May 2017). "The New Firework-Inspired Oreo Flavor Will Ignite Your Taste Buds With Popping Candy". popsugar.com. Retrieved 13 May 2017. ^ -, Marvo (19 May 2017). "Limited Edition Mississippi Mud Pie Oreo Cookies". theimpulsebuy.com. Retrieved 23 July 2017. ^ BELLOMO, RHEANNA (3 July 2017). "Oreo Is Officially Making Dunkin' Donuts Coffee-Flavored Cookies". delish.com. Retrieved 3 August 2017. ^ Marvo says: (2008-09-12). "Limited Edition Oreo Banana Split Creme". Theimpulsivebuy.com. Retrieved 2013-11-16. ^ "OREO Milk Shake recipe". Kraftfoods.com. Archived from the original on 2009-08-11. Retrieved 2011-03-02. ^ "Oreo products". NapaJapan. Retrieved 4 July 2016. Salam, Maya (July 3, 2017). "When Just Vanilla Wont Do, How About a Blueberry Pie Oreo?". The New York Times. ISSN 0362-4331. This page was last edited on 7 April 2019, at 23:39 (UTC).